IDC has released a new report on Indian smartphone market share in Q2 2017. As per the report, 28 million smartphones were shipped in Q2 2017 which is 3.7% Quarter-on-Quarter growth, whereas the Year-on-Year growth is just 1.6%. The growth is very small and is due to the recovery from demonetization which was introduced in Q4 2016. Also, the introduction of GST had a huge impact on vendors as everyone tried to sell out their inventory. But, there was a quick-recovery from June as the vendors’ adopted the GST in their sales channels. The coming quarters will be very profitable for e-commerce websites and offline channels, as they’ve already made changes to adhere to GST, cleared off the old stock and waiting for the festive season. From the past three-quarters – Q3 2016, Q4 2016, and Q1 2017, the Indian mobile vendors have recorded all-time low sales, but in Q2 2017, there was an 18% QoQ growth and still, the market share is limited to 15% of overall smartphone market share. This could be treated as a positive sign as of a slow recovery and the introduction of new 4G smartphones under $150 could further improve the market share of Indian vendors. 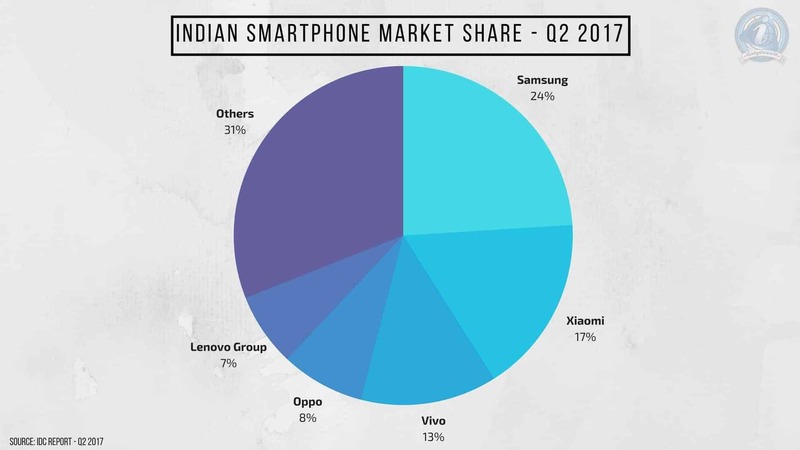 On the other side, Since Q4 2016, the Chinese vendors have occupied more than 50% in Indian smartphone market share, and this time their market share is increased to 54% with a 9% quarter-on-quarter growth. This clearly shows how Chinese mobile vendors are going to rule the Indian smartphone business in the coming quarters too. From the past few years, Samsung is unanimously leading the Indian smartphone market share, and Q2 2017 is not an exception. But, the rising Chinese vendors have already impacted the Samsung smartphone sales, as this quarter, Samsung recorded a 4% marginal drop compared to the same quarter in the last year. This decline was noticed last year itself, as Xiaomi dethroned Samsung with its Redmi Note 4 and became the best selling smartphone in the last quarter. It is evident that the coming quarters would be very tough for Samsung, and it has to come up with more budget-range smartphones to record a positive growth again. Since Q4 2016, the Apple of China – Xiaomi has occupied the second position in the Indian smartphone market share with a 25% QoQ growth. The introduction of several budget-end phones throughout the year has shown a positive growth in the sales. Also, like in the last quarter, in Q2 2017, 2 million Redmi Note 4 smartphones were sold out which made it be the highest shipped smartphone in a single quarter. Xiaomi also started to increase their offline presence, and the opening of authorized Mi stores – Mi Home helped to triple their offline shipments. The introduction of Mi 5X and Mi 5A will further increase their market share in the next quarter. With a strong 26% QoQ growth, the aggressive marketing techniques are helping Vivo to be in the third position. This time, the Chinese brand has occupied 13% market share from 4% compared to last year at the same period. As mentioned in my previous article, the offline marketing is the key factor in driving sales. The company is planning to invest even more in the in-shop promotional activities to further improve their sales. But, as the Indian mobile vendors have started recovering, it may impact the sales of Vivo. Just like Vivo, the Chinese brand Oppo has been applying aggressive marketing techniques in driving sales. But, this hasn’t helped to record positive sales. There was a sharp decline of 13% in the shipments but still helped the company to occupy 8% of smartphone market share in India. Also, the company has recorded strong sales in the price range of $200-300. This may continue in the next quarter too, but in the long-run, the company may experience a sharp decline in overall smartphone shipments. Lenovo, including Motorola, experienced a 25% drop in shipments QoQ, but Motorola brand saw a healthy 17% QoQ growth. This growth was due to launching new smartphones at the end of the quarter. In the coming quarters, Lenovo group may further lose the market share as the Chinese brands are growing stronger than ever. After declining for two-quarters continuously, the feature phone shipments in India recorded a 6.5% growth QoQ. A total of 34 million mobile phones were shipped in Q2 2017 which is 8.9% higher compared to the last quarter but neutral compared to last year in the same quarter. The growth could further continue as the introduction of Jio Phone has already raised excitement on both channels and customers. Once the sales start in Q3 2017, the feature phone market share could experience a record market share. Everyone’s eyes are on the festive season, and it’s expected that the overall shipments would increase which will further help Indian mobile vendors gain some market share.